At Huron Dental Center, we strive to make all of our patients feel comfortable during each visit, keeping them informed about all treatment options as they receive the highest quality of service. Dr. Rehemtulla was born in Tanzania and spent much of her childhood there and in Kenya, until her family moved to Canada in 1978. After earning her undergraduate degree in cellular, molecular and microbial biology with a minor in biochemistry from the University of Calgary, Dr. Rehemtulla served as a molecular biology research assistant there for one year. She authored several publications under her maiden name, Shyroze Nathoo. Dr. Rehemtulla then studied at Tufts University’s School of Dental Medicine, graduating in 1993 with a Doctor of Dental Medicine Degree (DMD). 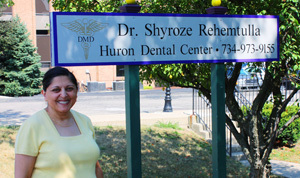 She then studied in the University of Michigan Graduate Prosthodontics Program. After graduation, Dr. Rehemtulla remained at UM to teach part time in the Crown and Bridge department — while also maintaining a private practice in Ann Arbor. Dr. Rehemtulla has been in private practice since 1994 and is married to Dr. Alnawaz Rehemtulla, a professor in the University of Michigan’s Oncology Department. They have two sons Jamil and Nabeel.